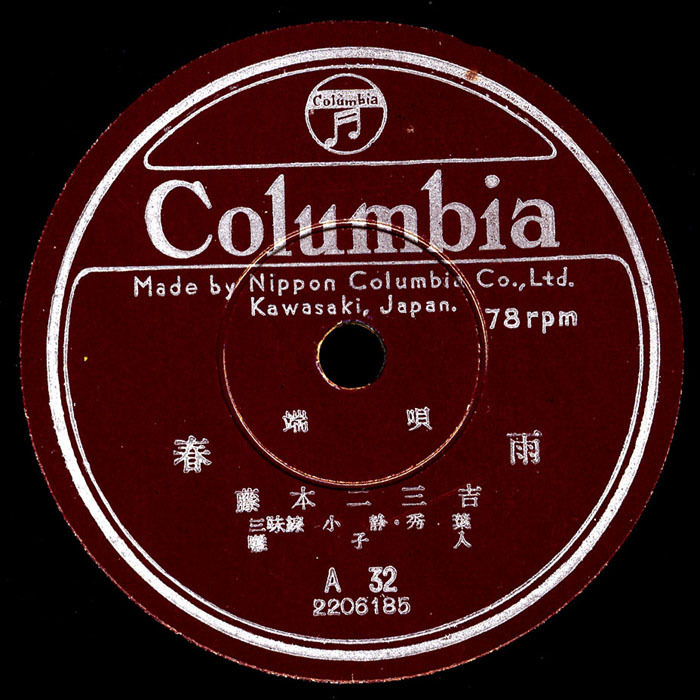 Here’s another great Japanese record on Columbia. This wild music is called Toori Kagura Tawamure, sacred music played at Shinto festivals for Kotobuki Jishi (Lion Dance). This particular piece is Edo Kanda Bayashi. In and around Tokyo, there are many shrines which have seasonal festivals, mainly in autumn, at which hayashi music and folkloric dance-dramas are performed for the public. The Hayashi is generally called matsuri hayashi (festival hayashi). Kanda Bayashi is one of them, which is used in the Kanda district of downtown Tokyo. The ensemble usually consists of a flute, two flat barrel drums played with two sticks, a gong and a big drum. Thanks once again to Mary Mariko Ohno, director of the Kabuki Academy in Tacoma, Washington, for translation and other info…these Japanese posts couldn’t have been done without her help…thanks! Here’s one of my favorite shamisen records, and since spring is upon us I’ve decided to post both sides. Tune in next week for one more Japanese record, after that we head down to Southeast Asia! 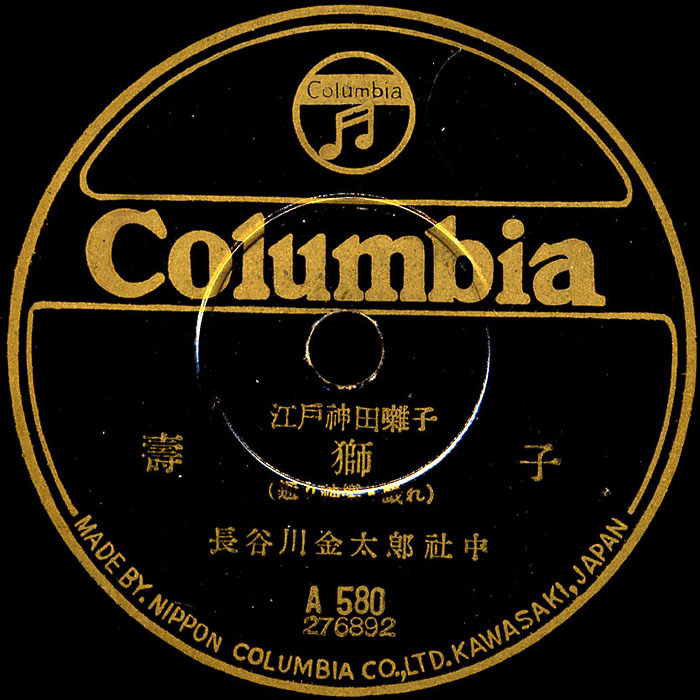 The first side is Ume nimo Haru (Plum Blossom in Spring), a well known hauta song that accompanies a dance of the same name. Hauta is a type of song popular in Edo (Tokyo) in the 19th century. 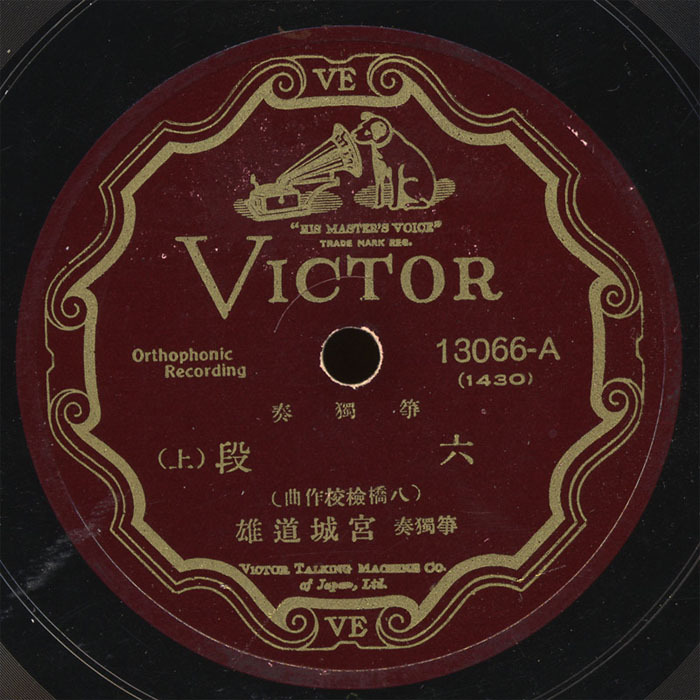 Sung by Fujimoto Fumikichi with shamisen by Koshizu Kin. The second side is Harusame (Spring Rain). Another big thanks to Mary Mariko Ohno, director of the Kabuki Academy in Tacoma, Washington, for translation and other info…thanks Mary! I’m a big fan of the shamisen and it’s ancestor the Chinese sanxian. Maybe it’s because the banjo was one of my first instruments? The shamisen and it’s family are typically three string fretless banjos with snake, cat, dog or calf skin stretched across the body. The Tsugaru style shamisen is currently in vogue, thanks to the Yoshida Brothers. Tsugaru style is usually fast, with virtuosic playing and it is uses a bigger, heavier instrument. Incidentally, Tsugaru has an interesting history, as told in comic strip form by California’s own shamisen monster, Kevin Kmetz. 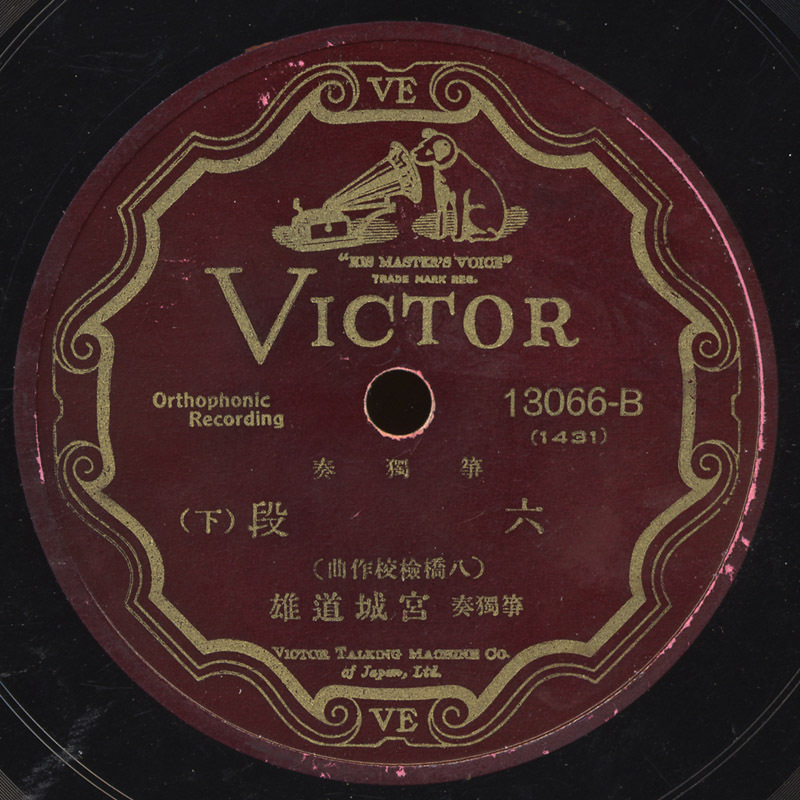 The song is the well known Yasuki Bushi which is associated with the “fish scooping dance” (see Excavated Shellac for another example). Here it is sung by Murano Koichi with shamisen played by Tachibanaya Kin-nosuke. 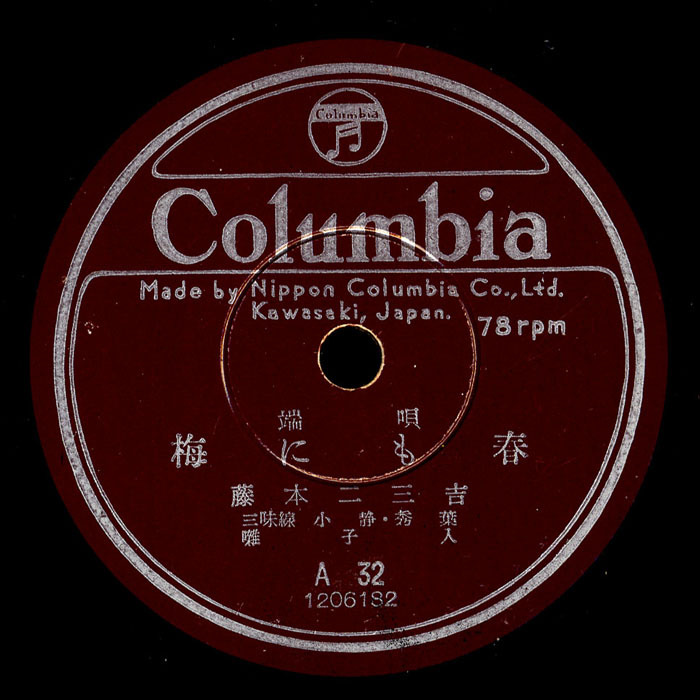 The label also indicates that this is a ko-uta; short songs typically sung by geisha. 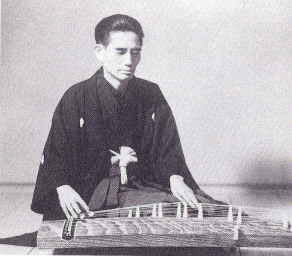 In January we heard an example of the Chinese zither called guzheng, and now I’d like to present one of it’s descendants; the Japanese koto. 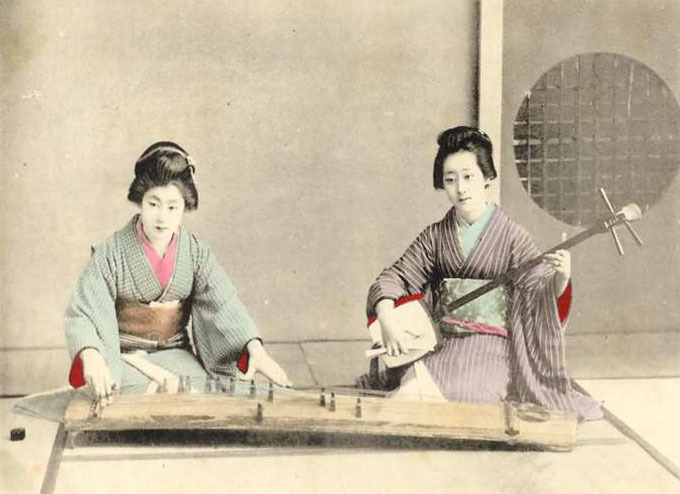 The koto came from China to Japan sometime between the 7th and 8th century and was used primarily in the gagaku ensemble, Japanese court music (see World Arbiter). Like the guzheng, the koto is a long zither with bridges and it went through many configurations over the centuries in terms of size, construction and number of strings. 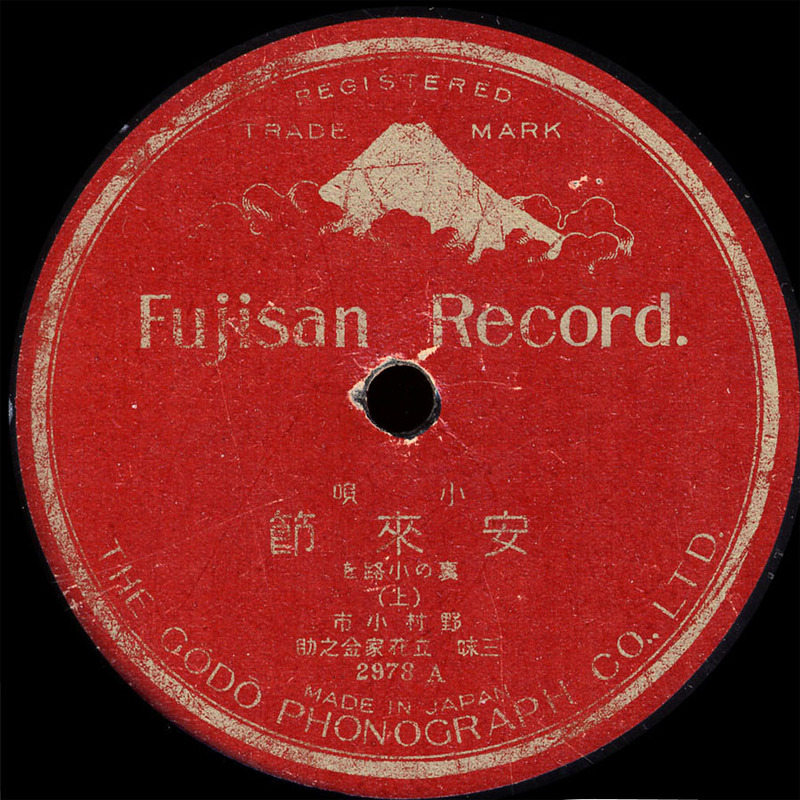 In the 17th century the gifted blind musician Yatsuhashi Kengyo (1614-1685) created a new style of solo playing and this record is one of his most famous pieces, Rokudan No Shirabe. 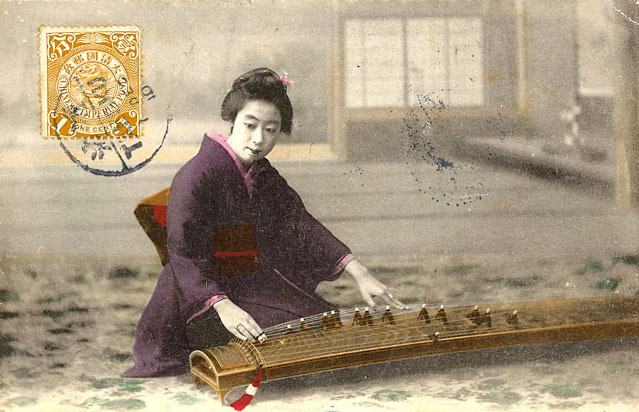 The Koto player featured on this recording is another famous blind musician, Michio Miyagi. He was something of a genius; teaching by age 13, creating new instruments such as the 80 string hachi-jyugern, making records, writing essays and exploring the music of the west. He published more than 500 compositions before he died in a train accident at the age of 62. Here is the full piece, Rokudan No Shirabe, from sides A and B. Thanks to Mary Ohno and Reiko Obata for help with this post.